partly bought from US surplus, partly built by Autophon. optional external antenna, hand cranked generator. plug-in frequency blocks / modules in the range 1,5 - 75 MHz with appropriate coils and crystal, the channel number/letter will appear in a little window, a second spare channel block is stored in the battery compartment. 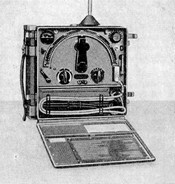 Manpack transceiver, A2/A3; 0,1 W, shortwaves 18 - 24 MHz. 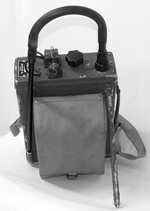 Manpack transceiver, A2/A3; 5 W, shortwaves 18 - 24 MHz. Batteries for reception only, hand cranked generator for transmitting. 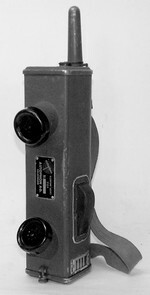 Manpack transceiver, A2/A3; 1 W, shortwaves 4 - 6 MHz. 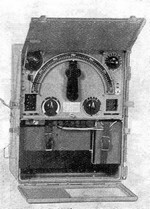 Manpack transceiver, A2/A3; 1 W, shortwaves 22 - 28 MHz. 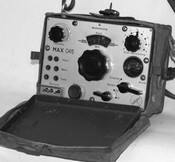 VHF manpack transceiver, A2/A3; 0,1 W; VHF 58,4 - 68,4 MHz. P5 manpack transceiver for onboard use on vehicle, A2/A3; 5 W, shortwaves 18 - 24 MHz. 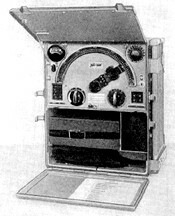 P5 manpack transceiver for onboard use on Vickers tank, A2/A3; 5 W, shortwaves 18 - 24 MHz. Transceiver operating in the 77,5 - 87,5 MHz range, FM. 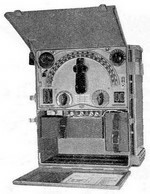 8 channels with 25 kHz - spacing, 3 common channels and 5 individual channels for each variant of the SE-125, the colour of the typeplate will inform about the variant, same coloured sets communicate on all 8 channels. Battery powered, 7,5V cells. 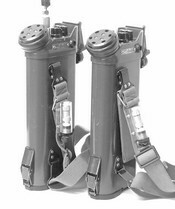 Squelch, solid state technology.